Methylation and genetic polymorphisms, like MTHFR, are hot topics in the field of mood and stress disorders, especially for naturopaths and nutritionists. Nutrition is the best option available to treat methylation defects, and improve your mood. Methylation is an enormously important metabolic process in the body. Disturbances in methylation have widespread influences on numerous body systems, and serve as risk factors for the development of a number of conditions. Ensuring your methylation cycle is working properly is vital to your health and well-being, especially if you are pregnant, require hormone support, need liver and digestive support, for cancer support and also for mood and stress complaints. Stress, anxiety, depression, infertility, and hormone imbalances are just some of the areas investigated. MTHFR genetic issues can be greatly helped with nutrition. Methylation is a bio-chemical process occurring in most cells right throughout your body. In technical terms, methylation is the transfer of a methyl group to another compound, involving several enzymes. The major roles of methylation are biosynthesis, regulation and detoxification. Methylation also involves the processing of several B vitamins, minerals and amino acids, in a large recycling type conveyor belt. To keep it simple, just think of it as a complex metabolic process operating in a series of cycles, which is used right throughout the body, and is very important to your health. So, as you can see methylation does A LOT! One of the big things it is responsible for in your body is the processing of a chemical you make called homocysteine. This is really important, as high levels of homocysteine in your body can be toxic, and can be a pre-cursor to things like heart attacks and strokes. But from a mental health perspective, high homocysteine is linked to mental health conditions, such as anxiety, autism and depression. And what is even more interesting, is that reducing homocysteine levels in the body, with nutritional medicine, has been shown to improve mood. Your nervous system, (which includes your brain), needs to have an effective method of communication, so that what you sense, (hear, see, feel, smell), can be transmitted to your brain for processing, to determine your next course of action. And in order for this communication to flow between your nerve cells to your brain and vice versa, your nervous system uses chemical messengers called neurotransmitters. You may be familiar with some of these; serotonin, melatonin, dopamine, GABA, glutamate, histamine, acetylcholine, etc. These neurotransmitters are made from amino acids, and produced with the assistance of nutrients, (such as zinc, magnesium, vitamin B6, iron, vitamin C), using the methylation process. Therefore, it follows that if there is an issue with your neurotransmitters, (such as too much glutamate, or not enough melatonin), the reason why this might be happening could be because your methylation cycle is not working properly. In fact, the amount of research on methylation in mood and stress recently has been huge, and it is now acknowledged as a substantial risk factor for conditions such as depression. 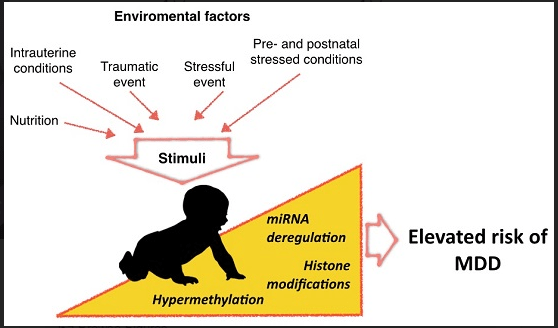 For babies, in combination with environmental factors such as nutrition, conditions in utero (just before birth) and stressful events, problems with methylation plays a key role in the progression of major depressive disorder (MDD). This is shown in the diagram below, and comes straight from a recent scientific research article, (if you like your science, click on the diagram to be directed straight to the article). What are the factors affecting methylation? There are many factors which can affect how your methylation cycle operates. It is vitally important for you to understand that these factors will all play a role in your methylation capacity. Although a lot of research has focused on the genetic mutations that affect methylation, (such as MTHFR which we will discuss shortly), you can have problems with methylation WITHOUT having a genetic mutation, and you can have a genetic mutation WITHOUT having problems with methylation. As the saying goes, your genes are not your destiny, and you can manage them well through your diet and lifestyle. Folic Acid - this is a synthetic, (man-made), version of folate, which is in many fortified, processed foods, especially bread. Folic acid needs to be converted from folic acid into folate, (5- Methyl THF), via the Folate Pathway. The healthy human liver can only metabolise around 400mcg folic acid within a one hour period, (stay away from supplements that have more!). Folic acid may compete with natural folates for their place on folate receptors and folate enzymes, which can cause problems for your methylation cycle overall. Folinic Acid - is half way in between Folic Acid and Folate, hence it is a partially converted form, and can bypass some of the steps needed to convert folic acid to folate. This makes it really useful as a supplement if you have problems methylating. Dietary Folate - the natural form of folate. Natural folates are destroyed by UV rays and cooking, so dietary provision of folate can be insufficient. Natural folates are degraded easily by your stomach acid, however, stomach acid also contains vitamin C which can help protect the folate molecule. 5-Methyl THF (5-MTHF) - the activated form of folate. Can be given as a supplement, and like folinic acid is great if you struggle to methylate properly. B12, B2, B3, B6 - co-factors important for all parts of methylation. Can be found in different (activated) forms. Betaine (TMG) - created from the amino acids choline and glycine. Really important for the methylation cycle occurring in the liver. Methionine - an amino acid found in the diet. Methionine is conveted via methylation to form homocysteine, which is then converted further to form glutathione, which is probably the most important antioxidant in your body. Homocysteine - formed from methionine, via methylation, and need to be constantly recycled. Homocysteine is important for you to make glutathione (a natural antioxidant), but too much homocysteine in your body is toxic. It is commonly measured in a blood test, and if you have too much, it means that your methylation cycle is not working properly. SAMe - is made in your body from a reaction between methionine and adenosine triphosphate, a molecule that carries energy. SAMe is a methyl donor, of vital importance to your methylation cycle and can be supplemented. SAMe has been used to treat psychiatric illnesses, infertility, liver problems, premenstrual disorders, and musculoskeletal conditions. SAMe has been widely studied for osteoarthritis and depression. There is evidence that SAMe may help reduce the pain of osteoarthritis. Some evidence is available for the use of SAMe for depression, fibromyalgia, and bile flow problems during pregnancy. SAMe has also been studied for its potential anti-inflammatory and pain-relieving effects. MTHFR - an enzyme involved in the folate pathway, crucial to converting folic and folinic acid to 5-MTHF, the active form. MTHFR can not work properly, due to genetic defects, and is now commonly tested when there is thought to be a methylation issue. One of the most common reasons for your methylation cycle not working properly is an issue with the folate pathway. You can see this pathway in the diagram below. Don't worry about the technical details, what is most important for you to understand is the vitamin co-factors needed for each step, and the enzymes (in orange boxes). The last orange box in the pathway, MTHFR, along with vitamin B2, is required to make 5-MTHF, which is the last step in the cycle, and the most activated version of folate. The MTHFR gene can be affected by a number of polymorphisms, with the C677T and A1298C polymorphisms being the most clinically relevant. If you are heterozygous, (one copy of the gene is affected), or homozygous, (two copies of the gene are affected,) for these polymorphisms then your folate cycle can be disrupted, affecting the homocysteine cycle as well as many other metabolic pathways. The table below highlights the potential impacts if one or both of these polymorphisms are present. If you suspect that you may have an issue with methylation, you can use the table below as a guide, to see if any of these symptoms correlate to how you are feeling. It is not definitive, but it may offer some insights. I think this might be me - what do i do now? So, now that you have read this far, you suspect that you have a methylation issue. It is important to find out the exact cause, because as we mentioned earlier, poor methylation came be influenced by a variety of factors. 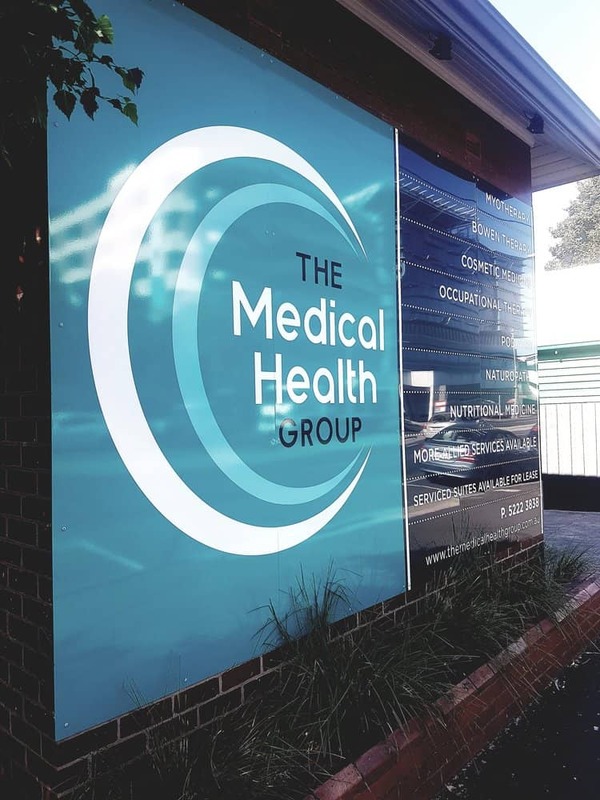 An initial consultation with a health practitioner specializing in methylation, (such as ourselves), will help paint a very clear picture of the underlying factors driving your problems. Methylation Profile - after an initial assessment, you practitioner may choose to run a number of tests, to determine the status of your methylation cycle, and also the cause of any disruption. A good test to aid assessment is a serum blood test, called the methylation profile. An example of one is pictured below. 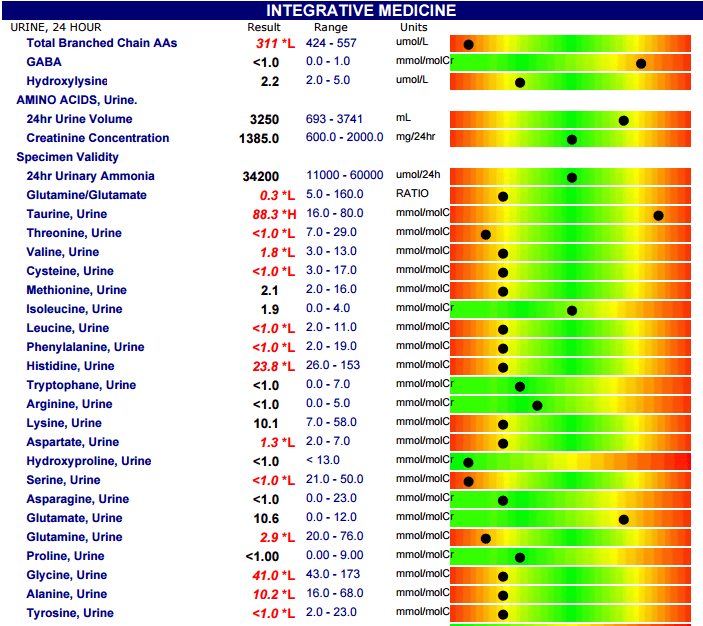 ORGANIC ACIDS – METABOLIC profile - Amino acids are precursors for methylation; plus, many amino acids undergo methylation during metabolism, e.g. methionine is the precursor to homocysteine, while glycine and serine are both methyl donors. Using amino acids, a practitioner can peer even more deeply into your methylation status. This might be appropriate in more complicated cases of neuropsychiatric disorders, infertility, or autism. For example, if methionine or glycine is abnormal, it could indicate aberrations in your methylation pathway, requiring either more amino acids or more methylation cofactors. Methylenetetrahydrofolate reductase (MTHFR) - is a genetic test that looks for compromised MTHFR-enzyme activity that may lower methylation capacity and cause elevated homocysteine. It assess with you have one copy, (heterozygous), or two copies (homozygous), of the gene mutation. 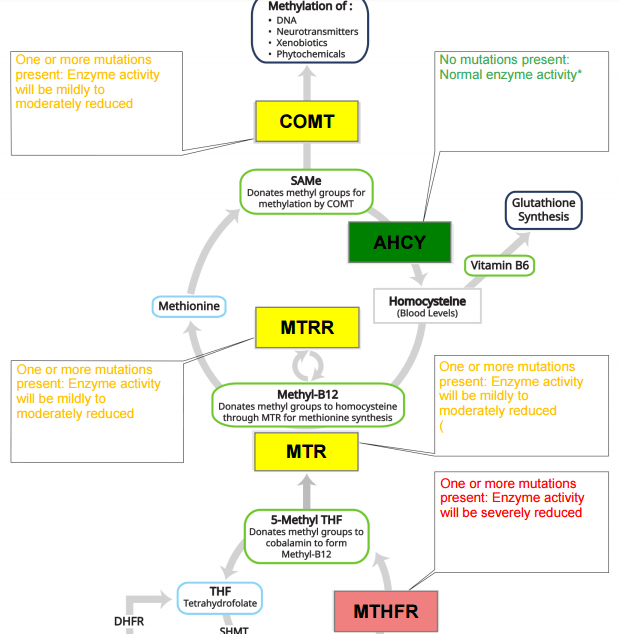 Advanced methyl genes - this test looks at more than just the MTHFR gene for mutations, and is a more comprehensive assessment. It's often used if the MTHFR test has come back negative, but a genetic influence on your methylation is still suspected. Having this knowledge about methylation is all well and good, but it doesn't help a great deal if you don't know what to do with it! So, we've put together some simple dietary measures which should help you. Please bear in mind as we mentioned before, the methylation journey is a long, hard road, and your patience and persistence will be tested. However, working together with your practitioner, you can achieve some amazing results, and dramatically improve the quality of your life. Regular exercise improves cardiovascular and general physical fitness, however it also shows benefits to genetic health. Yoga shows benefits for those with GST polymorphisms and hypertension, reducing blood pressure and increasing levels of antioxidants within the body. We have provided some links to research papers on Methylation, MTHFR and health for you below. With guidance from us and these simple tips, you can improve your methlyation cycle, and live a healthier, happier life.